The domestic services on High Speed 1 have had a transformational impact on the region it serves. They have also changed passenger expectations, with the usual complaints of reliability and punctuality considerably diminished, such is the performance of the Hitachi-built (and Hitachi-maintained) Class 395s. The services were formally launched by then-Prime Minister Gordon Brown in December 2009, having operated for six months prior as a ‘shadow service’. They were the headline act in terms of transport for the 2012 Olympic Games, moving millions of passengers over the six-week period with formidable efficiency. He says that the biggest challenge the railway faces is its own success. “The challenge is meeting the expectation,” he warns. When the service was launched, the service carried 7.2 million passengers. Today there are 15.3 million passengers, a 112.5% increase. Ashford to London journey times have gone from 83 minutes to 37 minutes for those using HS1. Visit Kent tourism accounted for 100,000 passengers in 2010 - now it’s 890,000. Looking at the market, it is obvious that the commuters dominate the user figures, but Statham is keen to highlight the rise in leisure travel. A report published by Visit Kent highlights that leisure users are now 30% of the overall total, and this is being analysed. Statham says they are trying to grow that market. “I see the economics increasing for tourism. There are 890,000 tourists in the area. That’s fantastic and helps regeneration. Margate and Folkestone, and Medway towns, are all growing.” HS1 is the driver of this growth, he says. But other areas are growing off the back of HS1 too. The franchise is due to be re-let next year, yet Statham remains focused on what can be done to improve. “How do you meet the demand? Kent County Council has said we need to keep growing the network.” He warns though that not much more can be done to squeeze more from the ‘395’ fleet. But what do the passengers think? Transport Focus Chief Executive Anthony Smith is enthused by the railway, and talks of its success. He says: “There are two big indicators of its success. One is the hard evidence from NRPS, which can pick out the HS1 route. The levels of satisfaction have been over 90% since it opened. For Smith, punctuality is key to the success of the railway: “HS1 delivers that,” he says. That is what passengers want most. “When you boil down the figures you see why people are happy,” he says, talking of the 93% satisfaction. But there will always be new challenges to face: “You have to increase capacity. The only declining survey statistic in passenger satisfaction is the desire for space to sit and stand. You could get a seat before, so it is a victim of its success. Higher frequency and longer trains are needed. Stephen Gasche is the Principal Transport Planner - Rail, for Kent County Council. He’s played a key role in the development of services on the route, and the campaign to bring the high-speed services beyond the likes of Ashford, Dover and Folkestone. He says of the Javelin service: “High speed to Kent was a step change in quality.” The campaign has been vindicated in the passenger figures, he says. The financial crash at around the time the services were launched meant that initial development plans around Ebbsfleet did not happen, but there is now to be a Garden Town there, as well as a theme park. Government plans for housing mean thousands of families will be able to move to the area, and HS1 will serve those who commute into London and, increasingly, to Kent. Gasche says of the Javelin service: “It is transformative. There is access to London but there is also value added for the Kent region. As well as the commuters, Gasche highlights the off-peak tourist market and says that Margate, Folkestone and Dover are proving really popular rail destinations. At the start of the trial, he says, there were 12 season tickets in Deal sold for travel to London. “Now there are more than 100 on HS,” he says. Journey time has been a key driver of that, but also the sense that Deal is directly connected to the capital. It means people have greater choice about where to live and have a better quality of life, says Gasche. For Gasche, there are several positives to the Javelin service: “I always say it is not just fast; it is reliable, pleasant and comfortable. The staff’s attitude is excellent, as is the service itself. KCC is contributing to the bids for the new Southeastern franchise and is talking to the Department for Transport about its vision. Says Gasche: “We have made a big, bold bid saying about a big uplift. That needs a larger fleet. The service needs to be 12-car at peak-time. Dyan Crowther is the Chief Executive of HS1 Ltd. The service operates on the railway she controls. More trains running on HS1 means more money for HS1 Ltd, which can then be reinvested. The railway, she says, has brought about significant regeneration and investment in areas that had been suffering from decline. She says that Dartford, served by HS services via the Classic Network, has the one of the fastest average house sales in the country, at an average of a fortnight from being put on the market to being sold. That, says Crowther, is down to the introduction of the high-speed services. Reliability of the railway, and the trains, she says, is another reason for the growth. “My railway is 65 miles with four stations. We are small but perfectly formed. We measure delays in seconds rather than minutes." Collaboration is very much the driver for the operational success. 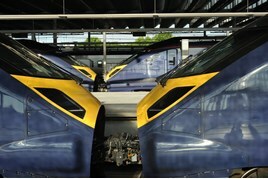 HS1 Ltd works with Network Rail HS, Hitachi and Southeastern to ensure standards are maintained. DB Cargo UK and GB Railfreight operate freight on the route, and Eurostar also runs along HS1, of course, and together they ensure the operations on the line. “It is our approach to be very collaborative. It is vitally important that we all play a part in delivering reliability and focusing on solutions that will help us maximise capacity. There are clear opportunities for the growth that Gasche calls for: “We operate at 50% capacity still. HS1 could be a release valve for the rest of the network. Our response to the franchise consultation is about finding more stock. One of our five areas of focus for the franchise consultation is about securing more rolling stock. “The ‘395s’ are reliable, but passengers also like to get a seat. “We want to protect the high levels of customer service and the provision of extra seats will be an important part of that." The introduction of the Javelin service has clearly had a dramatic effect on the region. The commuters flocking to live in Kent, a 112.5% increase in usage in less than a decade, and reports of house sales taking a fortnight tell the whole story. RAIL 839 features a 16-page free supplement looking at Hitachi's impact in the UK since 2007. It is available now on the iPad and Android, and on the shelves from November 8. This article has been amended from the copy in RAIL 839.